Scripts in the Metatrader 4 platform perform the function of running a one-time task which doesn't need to be repeated. MT4 scripts are widely popular due to the fact that they can be very effective when used correctly. What are MT4 Scripts and how can they help? MT4 scripts are somewhat similar to using macros in an excel spreadsheet. As you might know, macros are little pieces of programs that can save you from hours of doing simple tasks. In other words, macros automate the simple but time consuming tasks and also help in reducing any mistakes that can be made. Similarly, the MT4 scripts work such that the simple but time consuming tasks can be automated. And in trading, time can play a big role between winning and losing trades. Using MT4 scripts not only saves you time but also saves you from any slippage or price movements that might occur between the manual tasks that are performed. Scripts are more common among professional traders and used in different scenarios. The simplest of all being closing multiple orders to the more complex scripts that also forms an essential element of your trading strategy. MT4 scripts can do a lot of automation but the most important point to remember is that scripts run only once. In other words, if you need to do a task repetitively and consecutively then scripts do not help in this aspect. You might start to think why use scripts if they can be run only once? Well, for starters there are quite a few examples where scripts can be extremely beneficial. Take for example a trader who has over 10 positions in the EURUSD instrument and for whatever reason the trader now wants to close out all the positions. The trader can go about doing this in two ways. Either close the trades manually from the MT4 terminal window or simply drag and drop the MT4 script on the EURUSD chart to close the trades in the same instance. The above example should be obvious in pointing out the effectiveness of using MT4 scripts. If the markets were volatile then time is a critical element. By the time you move from closing the first open position to the 10th position, chances are that the markets might have already made a significant move, thus leaving you with lesser profits (or bigger losses). On the other hand, when you drag and drop the MT4 script onto the chart, all the EURUSD positions are closed out with little to no time delay, thus saving you money. Likewise, if you wanted to change the stops on more than one position in the instrument, the MT4 script can do it in an instant, unlike the manual method, which involves right-clicking on each trade and then typing out the new stop loss (or take profit) levels manually. The picture below gives a practical illustration. Notice that we have four open trades running currently. Using a simple ‘Close All’ MT4 script, a trader can save a lot of time. Right-clicking and selecting the ‘Execute on Chart’ option from the menu will result in all the open trades being closed out automatically. In a fast moving market, this feature can be very beneficial and in some cases can play a big role between profits or losses. 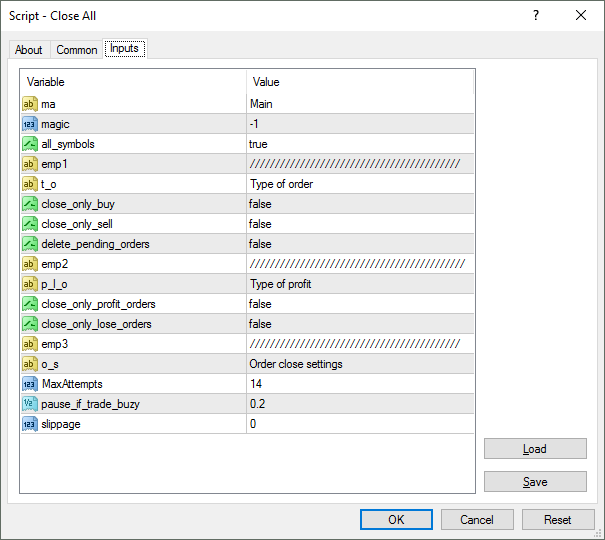 How to use scripts in the MT4 platform? This first step is very crucial as it helps in minimizing the number of confirmations when executing the script. Once this is done, the next step is to execute the script. Note that depending on the MT4 script’s complexity, the settings may differ. The picture above shows a sample settings window for the ‘Close All’ MT4 script. The settings may vary from one script type to another. In this example, the MT4 script we are dealing with is used to close multiple orders. From the settings it is obvious that there are many options such as closing only pending orders, closing only the losing or winning trades, closing only trades that use a Magic Number and so on. It is best to always select your settings and click on the ‘Save’ button to save the default settings so you can quickly use the ‘Load’ button to bring back your preferred settings. Once you fill in the settings, simply click ‘Ok’ to have the MT4 script executed on the chart. By default the MT4 platform does not feature that many scripts. 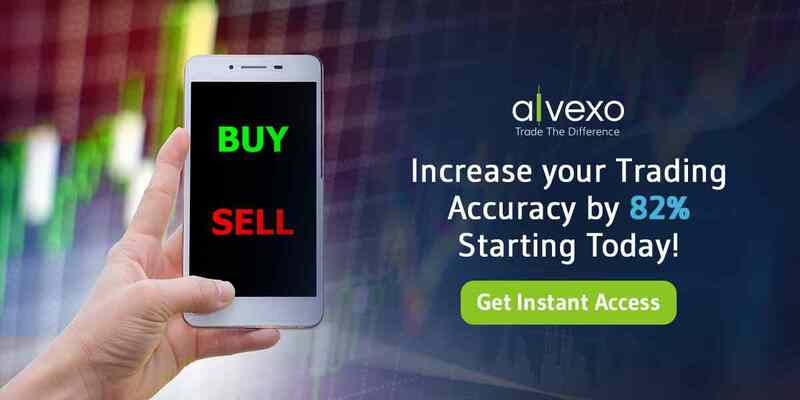 Therefore traders make use of custom scripts that are widely available. 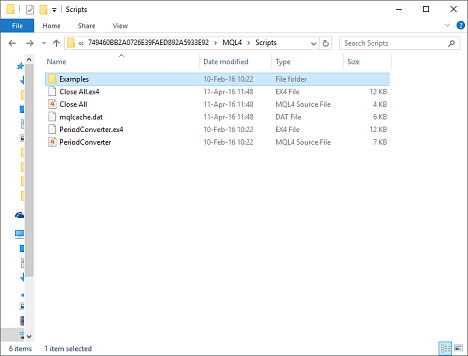 The MT4 scripts can be either in the MQL4 format or .exe format. 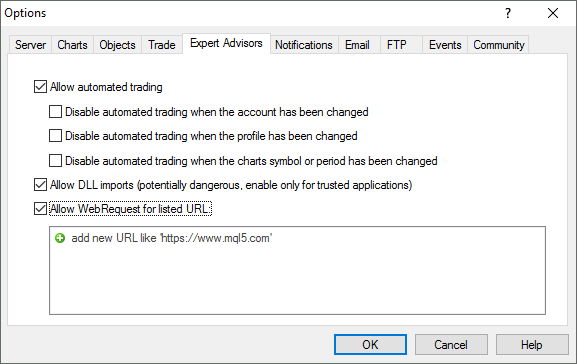 Once you have the script file, head to your MT4 trading platform and from the menu bar click on File>Open Data Folder. In the window that shows up, you will find various folders. Double click on MQL4 subfolder and then double click on Scripts subfolder. Here, you can paste the copied script file. Now head back to the MT4 platform and right click on the Scripts section and select ‘Refresh’ to update with the newly installed script files. If you trade intraday markets or use scalping as one of your trading strategies, making use of MT4 scripts can be of great help to assist you in saving time as well as money. There are many different types of MT4 scripts that can be used and most of them are freely available. Professional traders can also get custom MT4 scripts developed that can assist them in building customized MT4 scripts to help you in automating your trading strategies to a certain extent. In conclusion, MT4 scripts forms the crucial bridge to semi-automate your trading actions.